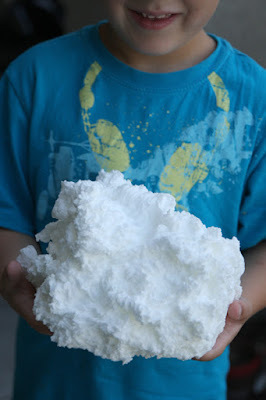 Stick a bar of Ivory Soap in the microwave - and make Soap Clouds ! Don't worry, the kids can still even use it as soap when you're done. Reminder: Only use IVORY bar soap. If you end up with a burned mess in your microwave, it's because you didn't use Ivory! I would stick to the plain, original bars, but you could try the Aloe scented ones and let us know how it turned out. NOTE: The fresher the soap, the bigger the result! Check Amazon to grab some Ivory bar soap. HOW TO: Place a piece of waxed paper, parchment, plastic wrap, or paper towel in your microwave. Just don’t use foil, or we’ll have issues on our hands that are much bigger than your next burrito tasting slightly like a fresh mountain spring. This really doesn’t make a mess, so don’t be scared. Requested Sept 21/08 for both Rob & I - will psot back when they arrive. bassetluv - thanks so much for letting us know. Too bad, it was a great freebie!